January 16, 2018 – In 2014, astronomers using the NASA/ESA Hubble Space Telescope found that this enormous galaxy cluster contains the mass of a staggering three million billion suns — so it’s little wonder that it has earned the nickname of “El Gordo” (“the Fat One” in Spanish)! Known officially as ACT-CLJ0102-4915, it is the largest, hottest, and brightest X-ray galaxy cluster ever discovered in the distant Universe. Galaxy clusters are the largest objects in the Universe that are bound together by gravity. They form over billions of years as smaller groups of galaxies slowly come together. In 2012, observations from ESO’s Very Large Telescope, NASA’s Chandra X-ray Observatory and the Atacama Cosmology Telescope showed that El Gordo is actually composed of two galaxy clusters colliding at millions of kilometers per hour. The formation of galaxy clusters depends heavily on dark matter and dark energy; studying such clusters can therefore help shed light on these elusive phenomena. In 2014, Hubble found that most of El Gordo’s mass is concealed in the form of dark matter. Evidence suggests that El Gordo’s “normal” matter — largely composed of hot gas that is bright in the X-ray wavelength domain — is being torn from the dark matter in the collision. The hot gas is slowing down, while the dark matter is not. 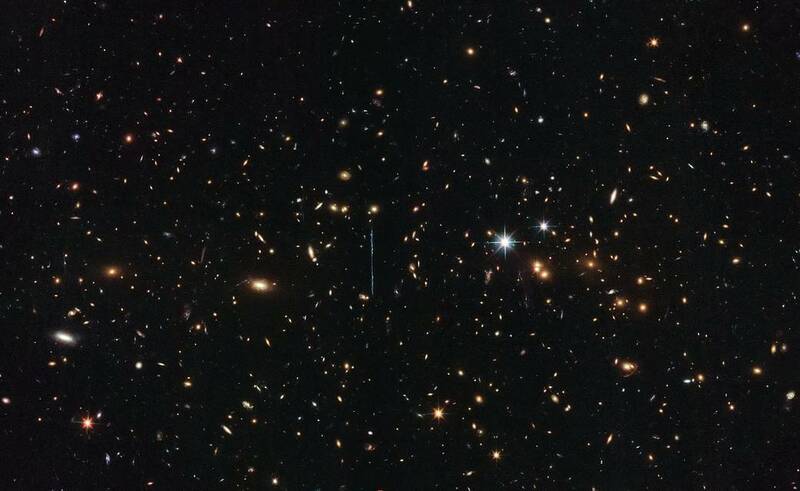 This image was taken by Hubble’s Advanced Camera for Surveys and Wide-Field Camera 3 as part of an observing program called RELICS (Reionization Lensing Cluster Survey). RELICS imaged 41 massive galaxy clusters with the aim of finding the brightest distant galaxies for the forthcoming James Webb Space Telescope to study. Both the Advanced Camera for Surveys and Wide Field Camera 3 were built by Ball Aerospace in Boulder, Colorado.